Cornish boiler is a simple horizontal boiler which belong to the shell and tube class of boilers. Cornish boiler is much like the Lancashire boiler. Cornish boiler has the ability to produce steam at the rate of 1350 kg/hr and can take the maximum pressure of about 12 bar. Dimensions of the Cornish boiler shell is 4 m to 7 m in length and 1.2 m to 1.8 m in diameter. 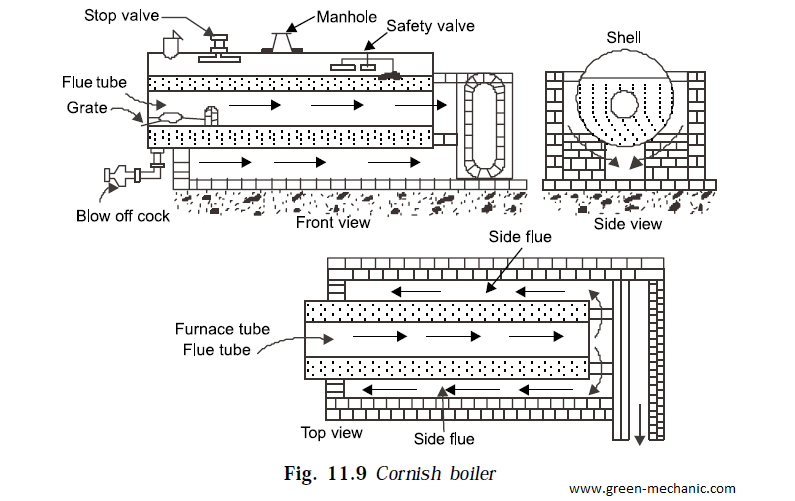 Cornish boiler is a fire tube type of boiler that is hot gases flow in tubes and water surround these tubes in shell. These are present inside the shell and hot gases flow through them. Flue are the tubes which take hot gases after they passes out from the fire tubes. Flue present at side of the horizontal shell are called side flues. Flue present at the bottom of the shell is called bottom flue. Bottom flue take the smoke toward the chimney. Grate is the place where fuel is added for burning. Ash pit the one which contain the ashes of fuel aster they are completely burn. Chimney take smoke from the bottom flue and take it out to the atmosphere. Fuel is added in the grate area where it burn to produce hot gases. There hot gases move into the fire tube which take it inside the shell where it exchange its heat with surrounding water. Water take heat and after some time it start boiling to produce steam. Hot gases upon reaching at the end of the fire tube, divided into two section and each move into the one of two side flue which take them once again at the front section of the boiler where they are move into the bottom flue and bottom flue take them toward the chimney. Chimney throw these gases out of the boiler into the atmosphere. In this process hot gases travels complete length of boiler thrice that is once in fire tube then in side flue and at last bottom flue. Maximum heat transfer is taken place at fire tube and shell section then taken place at side flue and at last at bottom flue. Thank's for recommendation. We will work o this and update the article the soon.